QUILTS ON THE WAY TO RUSSIA! On March 2, 1999, Shelli Olin contacted me to say that she would be leaving soon to journey to Russia to bring home a little boy that her family is adopting. While there she would be visit at least 8 orphanages and she could take some of our quilts with her to give to the children. We sent 10 quilts with Shelli. I wish that we could have sent more! There is so much need. 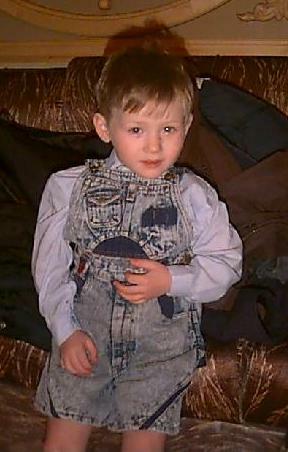 Here is a picture of her little boy, Alexander, who is waiting for his forever family. Just recently I received an e-mail from Shelli from Russia. She says, "Here's another photo taken of Alexander in March. 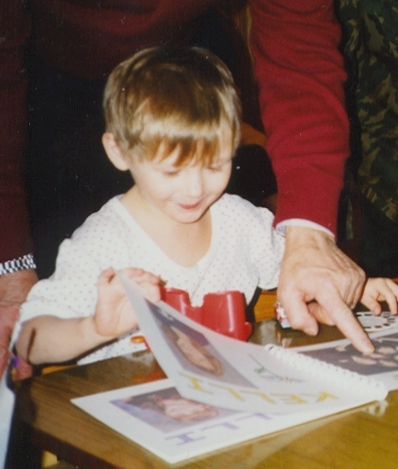 He is looking at the picture of us, he is so excited to have a family. When the people came to bring food to his orphanage and give him the birthday gifts we had sent, he ran to them asking where his mama and papa were, he asked each person in the room if they were his new family....his favorite thing was his "book", we had made him a story book of the whole family, even out little dog Annie was in it. In the picture he kept asking them to point to his "mom". Doesn't that just break your heart? Pray for us for safety in Russia. The papers were filed today and our visa applied for." We will let you know when Alexander reaches his new home. Shelli has promised to share pictures of the orphanges that she visits. With the help of WACAP Adoption services, we have just sent more quilts to Russia. There were families traveling to Russia during the second week of November to pick up children that they are adopting. They agreed to carry some quilts for us and deliver them to children in the orphanage.